Ezio Bosso (13 September 1971) is an Italian composer, classical musician and conductor. Born in Turin, Italy, Bosso learned to read and play music before the age of four. At the age of 14, he became the bass player for the band Statuto. Bosso later abandoned popular music in order to become an orchestral conductor and classical composer. He conducted such prominent orchestras as the London Symphony Orchestra. On 30 October 2015 his first major studio album, 'The 12th Room', was released and peaked at number three on the Italian FIMI albums chart. Bosso has won several awards for his compositions, including the Australian Green Room Award, the Syracuse NY Award and two David of Donatello Awards. His compositions have appeared in various films, performance art and theatrical productions. 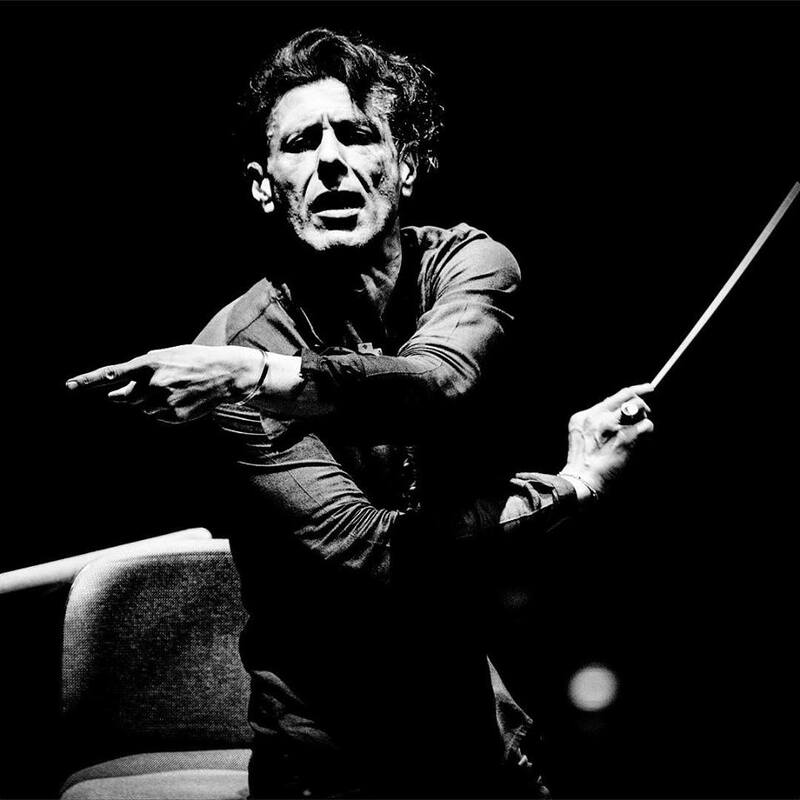 Ezio Bosso, Resident Conductor and Art Director of the StradivariFestival Chamber Orchestra, Sony Classical International Artist from 2016, and in February 2018 he was designated as a Steinway Artist. Moreover, Ezio Bosso is the Testimonial and International Ambassador of the Associazione Mozart14, official legacy of the social and educational principles established by the late Maestro Claudio Abbado, pursued with unique dedication by his daughter Alessandra. This confirms Maestro Bosso’s didactic and social commitment underlined by his intense dissemination activity, constantly emphasised through his concerts, his decision to open, where possible, all the orchestra or chamber music rehearsals to the public. He is the first conductor to do so: his lessons are open to everyone, but also his ventures with the Opera Pia Barolo and Medicina a Misura di Donna in Turin. Ezio Bosso is the official testimonial of the 2018 European Music Day. A conductor, a composer, a pianist when necessary as he loves to describe himself, Ezio Bosso intensified his concert activity in 2015 with a career constantly increasingthat, after having attracted an audience of over 100,000 people to the most significant theatres with his solo piano recital in 2016, considered as the most important classical music tour in Italian history, sees him today having just completed a long series of triumphant concerts at the head of some of the best Italian and international orchestras in his regained roleof conductor, after a few years’ hiatus. He was Principal and Resident Conductor of the Fondazione del Teatro Lirico Giuseppe Verdi in Trieste. It is worth recalling the Philharmonic Orchestra of the Teatro La Fenice in Venice for his comeback on stage in October 2016, the Orchestra del Teatro Comunale of Bologna, of which he was the Principal Guest Conductor and that he had triumphantly conducted both in the municipal theatre in December 2016 and in Piazza Maggiore withan audience of over 10,000 people acclaiming a huge success and attention unexperienced since the Opening Act of the G7 Environmental Ministerial Meeting, a prize-winning concert at the Live Awards in Lisbon as the best European musical event of the year; the Georgian State Opera and Ballet, where he conducted the opera gala with divas such as Nino Surguladze and Carmen Giannatasio for the traditional charity concert held on 1st May, that acclaimed over seven standing ovations and was watched by over 4 million people worldwide broadcast live on TV and online. The Orchestra dell’Accademia Nazionale di Santa Cecilia, the Orchestra del Teatro San Carlo in the prestigious setting of the Royal Palace in Caserta, the Orchestra Sinfonica Siciliana in the Ancient Theatre in Taormina, the Orchestra da Camera di Mantova, the Lithuanian Chamber Orchestra with soloist Sergey Krylov. An impressive series of long-awaited debuts, all sold out, crowned by much acclaim from both critics and the public, with an average of two standing ovations at each concert. Commitments crammed into an extremely tight schedule of only very few months, perhaps the only case of its kind on the international panorama. Not to mention the debut at the universally-famous KKL in Lucerne, entirely sold out, accomplishing two standing ovations and a continuous applause of over fifteen minutes. In the abovementioned concerts, Ezio Bosso moved more than 40,000 people with repertoires ranging from Bach and Schubert, Beethoven, Mendelssohn, Puccini, Pärt, Cage, Messiaen to Bosso himself. Bosso was born in Turin into a working-family but, right from his early performances, he expressed the desire to go beyond all boundaries which has characterised his entire, lengthy career. At the age of 16, he made his debut in France as a soloist, then he completed his studies in composition and conducting at the Vienna Music Academy(Wiener Hochschule) and he now collaborates with several European orchestras, among which the following are worthy of mention: the Chamber Orchestra of Europe, Festival Strings Lüzern, Deutsche Kammer-Virtuosen. Constant research, versatility, passion for dissemination as well as generosity have been the characteristic features of his artistic pathway and he has accumulated an extremely long list of collaborations undertaken with prestigious musical institutions along with concert seasons he has performed as a composer, performer, conductor and member of chamber music ensembles including:The Royal Festival Hall in London, the Sydney Opera House, the Palacio de Bellas Artes in Mexico City, the Teatro Colón in Buenos Aires, the Carnegie Hall in New York City, the Teatro Regio in Turin, the Houston Symphony Orchestra, the Perelada Festival, the Teatro Carlo Felice in Genoa, Lac Lugano, the Auditorium Parco Della Musica in Rome, Lietuvos Fhilarmonija, St Martin in the Fields. He has achieved many important acknowledgements, such as the Green Room Award in Australia (to date, he is the only non-Australian to ever win this prize) and the Syracuse New York Award in the USA; his music has been commissioned or used by the most important world-class opera institutions such as the Wiener Staatsoper, the Royal Opera House, the New York City Ballet, the Théâtre du Châtelet, the San Francisco Ballet, and the Bolshoi Theatre in Moscow to name just a few, but also by prestigious choreographers and famous directors. In London, where he currently lives, he was the Principal Conductor and Artistic Director of The London Strings. The many Orchestras he conducted over the years – prior to a break due to a delicate operation and to a subsequent neurodegenerative disease – include: the London Symphony Orchestra, the Czech National Symphony, the Orquesta de Cámara de Madrid, the Orchestra del Teatro Regio, The Philharmonic Orchestra of the Teatro Regio in Turin, the Orchestra dell’Accademia della Scala in Milan, the Lazio Regional Orchestra, the Turin Chamber Orchestra, the Wien Residenz Orchester, the Bonn Kammer Orchester, the Orchestra dell’Accademia Mozart, the Orchestra Verdi in Milan, and The Sydney Youth Orchestra. He has also undertaken collaborations with great soloists, such as Mario Brunello, with whom he has had an intense duet partnership, with Francesco Manara (Concertmaster of the Orchestra of La Scala), Roberto González (Concertmaster of the Orchestra dell’Accademia di Santa Cecilia in Rome), and the brotherly relationship that unites him with violinist Sergey Krylov. In 2015, The Art Newspaper (the most authoritative arts-related periodical newspaper worldwide) and Penelope Curtis, the director of Tate Britain, described his concert, held inside the Ikon Gallery as “the artistic event of the year in the UK.” In the same year, he was chosen by the Alma Mater University in Bologna to write and conduct his Symphony No. 4 dedicated to the Magna Charta of European Universities and which contains the first official anthem of this major global institution. Ezio Bosso is a worldwide performer for Sony Classical International, that has released his latest works entitled “The 12th Room” that has won the Gold Record Award with over 50,000 copies sold, the anthology “Ezio Bosso… and the Things that Remain (from 2004 to the present day)” as well as “The Venice Concert,” with violin soloist Sergey Krylov, which featured the live performance that initiated his comeback to the baton at the Teatro La Fenice. Overall, these most recent chamber music and symphonic titles have sold more than 20,000 copies, breaking yet another record on the Italian classical music market. Many of his unpublished recordings will soon be released.